Better Button - Knowledge Base - How can I cancel my account via Shopify? Knowledge Base Shopify How can I cancel my account via Shopify? 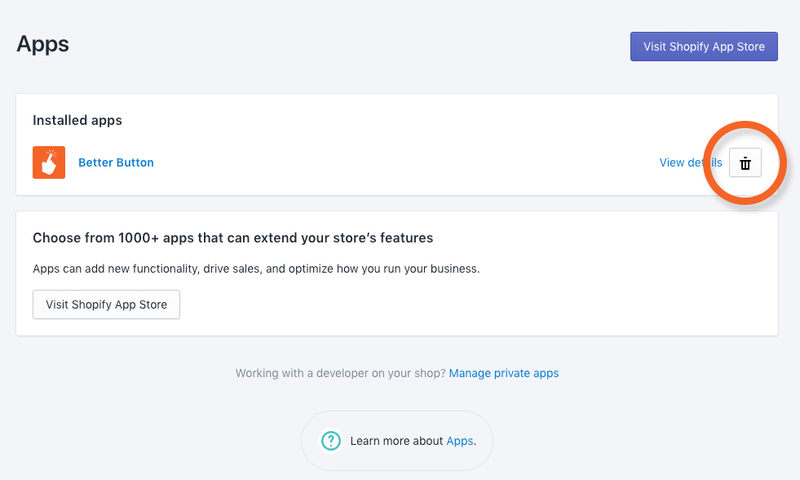 If, for some reason, you decide you'd like to cancel your subscription for Better Button and remove it from your Shopify store, you can simply login to Shopify, go to "Apps" and click the trash can icon next to the app you'd like to install. Uninstalling the app will cancel your billing suscription, remove our code from your site and cancel your account with Better Button. If you decide you'd like to give Better Button another try at a later date, you can simply reinstall the app into your store.